The Metrolinx board met on Thursday, April 28 and there were a few items of note on the public agenda. An update on the Toronto Transit Plan set out the Metrolinx position in the still-evolving relationship with the City of Toronto and Mayor Ford. The report reproduces a map we have seen a few times now (page 4), and its inaccuracies raise a few questions of their own. Although the eastern end is shown as Scarborough Town Centre, it will really be at McCowan although this may just be for yard access. McCowan is a minor station on the SRT and Metrolinx could save the expense of rebuilding it simply by dropping it from the line. McCowan Yard may be repurposed as a depot for some of the LRVs operating on the Eglinton/Scarborough corridor. At the western end, the map ends at Black Creek and the new maintenance yard. Metrolinx needs to rethink the whole section through Weston Road and out to Jane Street given the new “all underground” design. During the EA phase, the TTC (and behind them Metrolinx) fought bitterly against an underground option at Weston on the basis of cost. 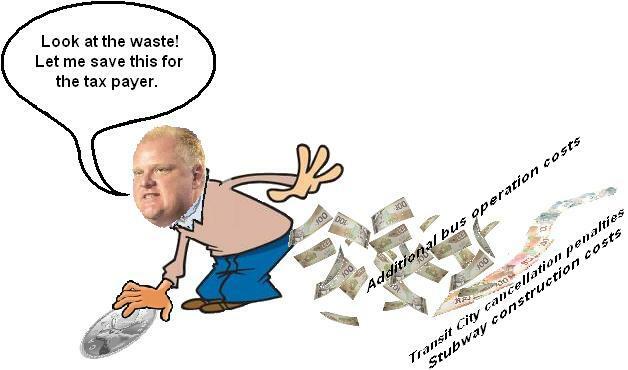 Now, Metrolinx is prepared to spend billions to placate Mayor Ford and get their project underway. Thanks to this, the line may never get further than a connection to the GO Weston corridor. I spoke to Bruce McCuaig, Metrolinx CEO, about the extra cost of burying the Eglinton line and what this might do to the supposed benefit/cost ratio for the project. He replied that the numbers still look good because, in part, the faster trip will attract more riding to the line. Metrolinx hopes that up to 50% of riders from the Scarborough leg will opt for the through ride across Eglinton rather than changing to the BD subway at Kennedy. That may be, but the Metrolinx analysis model is skewed to favour expensive projects because it counts the economic benefit of the construction cost — the more you spend, the greater the benefit. The same money could be spent elsewhere, and the spinoff benefit would shift to another corridor such as Finch or Sheppard. It’s not specific to Eglinton. Metrolinx has been evasive on the subject of station locations. They talk about 26 stations, but this appears to be the simple math of assuming a 1km average spacing on the 25+ km route. That will certainly be fewer stations than originally proposed for the subway-surface Eglinton LRT, and Metrolinx is keenly aware of the cost difference between a $10m surface station (even that sounds extraordinarily high) and a $100m underground one. In a separate comment thread, one reader has pointed out that preliminary design work for stations on the west end of the line notably omits Oakwood which is close to Eglinton West. The table on page 5 raises a question about underground construction because it suggests that Eglinton may be all below grade. (The difference between the total length of 25.2km and the tunnel length of 19.5km is almost entirely accounted for by the SRT mileage.) However, the Memorandum of Understanding between Metrolinx and Mayor Ford clearly states that the Eglinton line would be below grade except at the Don River crossings. In his verbal presentation at the meeting, Metrolinx VP Jack Collins left the question of the valley crossings open for future design work. The report sets out the terms of the MOU which were discussed in an earlier post. An amusing note on page 7 states that the MOU “provides [a] framework for negotiation of agreements to be approved by each party’s governing body”. The last time I looked, that’s Council for the City of Toronto, a body notably absent in the discussions to date. Construction plans for Eglinton will see actual tunneling begin in 2012 when the first pair of Tunnel Boring Machines (TBMs) is delivered from the manufacturer, Lovat. These will drive east from an access shaft at Black Creek, and two more will drive west from an access originally planned for the hill east of Brentcliffe and Eglinton in East York. The plan may change thanks to the undergrounding of the east leg, although the extraction site (the point where the two tunnels will meet and the TBMs will be removed) is, for now, still at Chaplin where the tunnel is close to the surface. Tunneling should be finished on the central section in late 2014 followed by station construction. All stations will be built to 3-LRV lengths (110m) from the outset rather than making shorter versions with extension capabilities. The ridership projection decades into the future sits at about 12,500 at the peak point, and this does not require full subway capacity. Construction of the added tunnel sections cannot begin until the TBMs from the central portion are finished their work, presuming that the “extensions” will be bored, not cut-and-cover. This raises the intriguing thought that a new Mayor and Council may be in place before work actually starts on the outer parts of the line, but that’s not an option anyone is talking about for obvious reasons. Construction staging will be reviewed as part of the redesign of the eastern and western sections, and options for early opening of part of the line will be reviewed. One possibility might be to operate the Scarborough leg as an independent segment before construction on Eglinton reaches Kennedy Station. The Finch project came up in discussion because it is still officially on the table in Metrolinx plans for 2018. McCuaig replied that Finch was still a Metrolinx priority for “higher order transit”, and the project would be discussed with the City of Toronto “at an appropriate time”. During the media Q&A, I asked about the option that up to $650m in “left over” money from the Eglinton/Scarborough project might be transferred to the Sheppard line. Metrolinx will be in no position to know it actually has a “surplus” until fairly late in the game, certainly long after City Council would have made a decision of the financial plan for the Sheppard project. Bruce McCuaig replied that the Metrolinx and City projects are on the same timeframe, although this implies that the Sheppard project will be much more extended than Mayor Ford’s original claims of having the line open by 2015. The rollout of Presto is now well underway and the GO system will be completed this summer. Implementation schedules for various systems in the 905 depend on each of the local operators, but all are expected to come on board this year. OC Transpo (Ottawa) will implement Presto in 2012. This leaves Toronto, although Metrolinx is hopeful that thanks to the MOU with Mayor Ford, plans to embrace an alternate system are now off of the table. This does not entirely fit with statements yesterday by TTC Chair Karen Stintz as reported in the Sun. I have heard that the TTC has received an attractive offer for implementation of an “open payment” system, but this has not yet been made public. A choice of systems will be made by the Transit Commission by June, according to Stintz. This sounds like sabre-rattling in the interest of better funding, and argument that has merit considering the disproportionate spending by Queen’s Park on GO Transit (see below). The Metrolinx budgets were presented for the Board’s information. They are not yet in final form as approval has not come from Queen’s Park for what was submitted, and that is expected before the June board meeting. To me, the most interesting part of these budgets is a comparison of GO with TTC. GO’s total revenue, almost entirely from fares, is expected to be $338m on total expenses of $427m, or 79%. Revenue grows from a combination of better ridership (2% in the budget, but 3-4% is expected based on recent experience) and an increase in the average fare (about 1.3% due to increasing riding from new parking lots on the outer ends of lines). Total ridership for 2010-11 was 57.8m. GO finds that parking capacity is key a driver for ridership, but without train capacity, parking alone isn’t enough. Increasing all trains to 12 cars is the short term answer. The Board briefly discussed the fact that one cannot build parking lots forever, and that there is a role for local transit, cycling and walking as feeder modes to the rail network. This ties in with the “Mobility Hub” concept, something that looks good on paper, but which always seems to take a back seat to more parking. No fare increase is expected in 2011-12 because of the strong revenue position, but also because the subsidy from Queen’s Park goes up from $83.6m to $91.0m. (8.85% relative to last year’s subsidy, and over 2% relative to fare revenue). It’s easy to freeze fares when your subsidy goes up, a factor not mentioned in the presentation. On the expense side, “operations” goes down slightly because this budget line includes payments to CN for track rights. Now that GO owns more of its system, these costs drop, but there is an increase under “facilities and track” that GO must now maintain, and to a passenger, not freight, standard. GO expects the cost of diesel fuel to rise faster than the 2% factor allowed for most other parts of their budget. Any problems with budget creep (either from lower approvals in the final version, or through unexpected cost pressures) would be addressed by delayed introduction of new services and by “expenditure restraint” for items that don’t affect customer service. That’s an odd comment — one would hope that there are few big ticket items in the budget already that don’t bear somehow on “customer service”. On the Capital side, Metrolinx is now evolving away from its GO Transit background to a wider scale. Total funding for this fiscal year includes $316.3m for GO state of good repair. GO has a capital asset base of about $5b, and it doesn’t stay in good shape without considerable reinvestment. GO expansion projects will consume $662.4m, not including the Georgetown South and Airport projects that have $294.1m. Finally, $665.7m will be spent on Rapid Transit, in effect, the Eglinton/Scarborough project. Details are in the linked presentation. The GO Board was very impressed that management had come in almost exactly at the budgeted spending level for capital in 2010-11. This was achieved by shuffling money among budget lines to accommodate changing conditions and to use up GO’s allocation in the “use it or lose it” world of Provincial budgets. By contrast, City policy prevents the TTC from shuffling money between projects as this can lead to unexpected, unbudgeted future project costs to make up for scope creep and to “repay” monies borrowed from projects that were running late. Contrast GO Transit with the TTC. The only operating funding the TTC receives is taken from the $150m in gas tax revenue. About $91m of this goes to the operating budget and the rest to capital. There was no increase in this revenue stream in 2010, and demographics cause the share Toronto gets to fall, not rise, as the 416 becomes a relatively smaller part of the population. As I discussed in another article, the only capital funding stream that is no project-specific (such as the Spadina Subway) or winding down is the gas tax. GO gets over $300m for its state of good repair budget, while the TTC gets $150m in gas tax, of which only $60m goes to capital. The balance rests on Toronto’s shoulders. The TTC’s operating budget for 2011 is about $1.43b with total ridership of 487m. That’s 3.3 times the budget of GO to carry over 8 times the ridership. The big differences, of course, are that TTC riders travel much shorter distances on average than GO riders, and over half of TTC riders travel outside peak periods. The average fare on GO was $5.53 in 2010-11, while the average TTC fare was $1.94. TTC’s operating cost recovery stands at about 70% compared with GO’s 79%. Although the GO percentage recovery is higher, the dollar subsidy is also higher because of the much higher cost per rider. GO’s rail car fleet will grow to over 500 bi-levels in 2011, about 70% of the TTC subway fleet size simply counting raw cars. Again, the relative size of the fleets shows the much higher productivity of the TTC’s network on a passenger trips per vehicle basis. This report gives an overview of many aspects of GO’s operations and capital projects for the first quarter of 2011 (the last quarter of GO’s fiscal year). Beyond what has already been covered, the most interesting discussion among Board members was the observation of how important proximity to GO service has become in selling new developments along GO corridors. This shows there is a market for car-free (or at least car-reduced) commuting, but this can only occur if governments invest in good service. This report addresses the GO project. As work progressed on early stages of the work, its complexity grew as GO’s contractors found unexpected site conditions. This has delayed the project, although other changes are hoped to bring this back closer to the original schedule. Some of these changes are detailed in the presentation. Pages 6-7: The northernmost span of the trainshed will be rebuilt more or less “as is” to preserve an example of its heritage character. Most of the central portion will be removed and replaced with a glass atrium. The east and west wings of the trainshed will be rebuilt in a form similar to the existing shed, but without the attention to heritage materials to be done on the northernmost span. Page 10: This shows columns exposed in the preliminary stage of replacement, as well as a challenge posed to construction by the maze of conduit under the track slab for GO’s signalling and passenger information systems. The original construction plan had 11 stages, but this has been reduced to 7 (pages 13-14). Also, the original scheme used mobile cranes within each work area, but this arrangement presented many problems for actual construction (pages 15-16). Instead, a tower crane will be erected between tracks 7 and 8 (platforms 14/15) with a reach that will cover the work site. The crane will be anchored below the basement level, and will occupy a space in the middle of the VIA concourse. All of the work at Union Station will be done with the future electrification project in mind. One effect will be that the new smoke vents over the tracks will be about 6 inches (about 15cm) higher than at present to give extra clearance for the overhead. The electrification has also required a redesign of the window washing scheme for the glass atrium which will be above the tracks. The new construction schedule aims for fall 2016 completion, two years after the original target, but GO hopes that they can improve on this date through planning and experience as the work progresses. This entry was posted in A Grand Plan, Beyond 416, Eglinton LRT, Fares & Fare Collection, GO Transit, Transit, Union Station. Bookmark the permalink. In my attempts to keep my comment shorter, I did not explain my points very well. Sheppard subway construction started in 1994 and finished in 2002. Thus, 1 year of costs are attributable to the NDP (equivalent of less than 1 station out of 5). There was a Quid-pro-quo dance between Harris and Lastman, but this was just posturing to appeal to their respective bases – and Sheppard did get built. The YUS extension to Downsview Station, with construction from 1992 to 1996, was mostly done in the time of the NDP. For the Vaughan extension, construction started in 2008 and it is expected to open in 2015. Thus, just under half of costs are attributable to the Liberal government (equivalent of 2.5 stations, not 1, out of 6). Going back farther, you can give Peterson credit for the North York Centre infill station in the late 80’s. If we look at periods when subways were not being constructed, it is 2003 to 2007 and 1988 to 1992. These were predominantly Liberal periods. You can also look at stations or kms built per year in office. So although Harris was no Transit saint, he was just as good if not better than the others in the past 25 years. On the Operating Budget side, it is easier to blame Harris, although even now, 8 years later; this government has not restored funding to previous levels. Announcements are a dime a dozen. The one who should get credit for a subway project is the one who pays. The Sheppard and Vaughan Extension were both announced near the end of a governments term, when both governments were not expecting to win (although the Liberals did win unexpectedly in 2007), thus leaving most of the costs to the next government. After the Liberals did win the election they deferred funding to again put it on to the next term. If a government was serious about transit they would initiate construction near the beginning of their term and have a good portion of the costs in their first term, or a completed line with one further election victory. And this hasn’t happened since the 1970’s. Steve: It’s not quite that simple. Subway projects take a long time, and announcements tend not to occur under unfriendly governments. Moreover, an incoming government can inherit a previous regime’s projects as happened with Harris and the Sheppard line. In some cases, governments prepay for projects into holding accounts that may outlive them. For example, the provincial share of the Spadina extension is already in the bank from good times a few years ago, paid by the Liberals, even though it won’t be entirely spent until Hudak may be in office. Frankly, I find the whole switching to ICTS from LRT on the Eglinton line debate to be a classic case of putting the cart before the horse. Simply put, has anyone bothered to even start a study on what impact an extended Sheppard subway would have on ridership patterns between STC and the Yonge line with a completed Eglinton line? While it still looks like a pipe dream, Ford has been starting to give the appearance of gathering the political favours needed to overcome the lack of private sector funding for an extension of the Sheppard line. Whether those favours translate into actual funds remains to be seen. However, it might be enough of a possibility now to factor in the impact a Sheppard subway to STC on the long term ridership outlook on the Eglinton line before we start talking about switching technologies. Otherwise, we may end up with a very expensive Cadillac solution for something that actually requires something a lot more modest. I am spending a week in Washington DC and have just come back from a trip to Union Station for National Train Day. I went through 5 Metro entrances and all but one of them had at least one escalator out of service for repairs. There were at least 5 stations on the Yellow and Green lines with out of service elevators. Headways seem to be at least 8 minutes or more on the lines I rode though there were 6 and 8 car trains. The cars are 75 ft long with 3 double doors per side and mainly double double seating. Their maximum speed is 75 mph with very good acceleration. This is counter acted by the fact they have one person operation and when the left hand doors open it takes about 10 to 15 seconds to change from the right side to the left side and turn on the door switches. There has to be a better way because I have experienced this problem on other lines. I hope it doesn’t happen to Toronto cars if we ever go to one person crews. The two interchange stations that I used showed all the hallmarks of great TTC design. A side platform station crosses a centre platform station with the interchange at one end of the side platform station. Did the TTC do consulting work for Washington? The lighting levels in the stations are very poor. I kept taking of my regular glasses and putting on my sunglasses because I thought that I had forgotten to change them. Steve: Yes and no. A former General Manager of Subway Construction was a consultant to Washington, but how much influence he had is hard to say. The fare system is fare by distance so you need a ticket to get on and get off. They sell magnetic strip one way, return trip and day passes. They also have an RFID card that you load up with money. If you run out of money on the card you can refill it in the fare control area so you can get out. There bill readers are about the best I have seen anywhere but they still have problems. They may save money by using one person crews but they have one cop for every car in the fleet though they do not have them riding in every car. DC is cop happy. They have transit police, parks police, city police, AMTRAK police plus all of the many other alphabet combinations found in the US. They also seem to have 2 or 3 station attendants who do not sell tickets but will help you work the machines and show you were to go. Washington Union Station is huge, has at least 28 tracks and serves just under 30 000 passengers today. They complain that they do not have enough waiting area for passengers. They should try our Union Station. I have not had a chance to see their surface system at rush hour but they seem to have decent headways and a set of circulator routes that go through the main downtown areas including Georgetown. Robert … Norman Wilson designed our subway interchanges and he died shortly after Bloor opened, so Washington is just a co-incidence. I’d say he messed up on Yonge Stn., and he never really designed St. George as an interchange. If he had, the platforms there would have been much wider, as they should have been at Yonge. He always saw it as a normal station for passengers starting and ending their trips there, and put too much emphasis on the wye. In consultation with NYC, there was an alternate design for a single very large cross-platform interchange station to replace St. George and Bay in the early 60s, but this was dropped in favor of the wye. I never said that Eglinton would need 48k per hour, but it could go as high as 20k per hour, and 6-car ICTS MK2 trains can handle that, whereas LRT would choke. Why not buy that as extra insurance if cost is the same? The original Eglinton LRT is based on some street-running. Now that that’s changed, the technology choice needs to be re-examined. I have always felt that this section of the Eglinton line should be built on the south side of Eglinton to maintain a separation from traffic to enable a truly “rapid” system all the way to Don Mills. Ford is so hell-bent on separation from traffic that he will have the money spent to make it as extremely separated from traffic as possible, when a much lower cost could achieve the separation. Why on earth is it good to lower office budgets because the lower amount can “get the job done,” but not so with transit development? The man’s “respect for taxpayers” is nothing but BS. He will continue to make a big thing about efforts to save pennies while C-notes fly out his back pocket like water over Niagara Falls. At this point, I’d be concerned that any re-design that delays the construction of the central tunnel, might push the whole project closer to the chopping block. Regarding the capacity: please correct me if I am wrong, but I don’t see how ICTS / ALRT can support significantly higher capacity than LRT, if the train widths and station lengths are similar. Automated train operation can work with LRT, too. If the demand reaches 20k pphpd, it will require 40 trains per hour (90 s headways) with 500 passengers per train (167 per car), or 30 trains per hour (120 s headways) with 670 passengers per train (223 per car). 120 s headways are certainly feasible, and 90 s headways might be feasible. According to all forecasts, the demand will be well below 20k on the opening day, or even in 2031. Longer term, it should be possible to order customized semi-permanent trainsets for this line with only 2 cabs per train (instead of the currenly ordered with 2 cabs per car, 6 per train). Thus, the floor space will be used efficiently. The only remaining disadvantage of low-floor LRT will be wheel wells that take up some floor space, but how much capaity is lost due to those? 5%? Capacity of the platforms and stairs at the major interchange stations might become a problem, if they are designed for the 7 or 8k demand but have to handle 20k instead. However, that applies to ICTS as well as LRT; we don’t need to change the rail technology to build larger stations. Why would anyone on Metrolinx want to convert to ICTS, when a fully grade-separated LRT line could provide the same frequency and capacity? On top of that, switching to ICTS would effectively cancel the existing LRT contract (a penalty). I can’t see any advantages for switching to ICTS.